Djamel Bouras was a French judo champion, nicknamed “La Bourrasque” (the squall) for his sudden fits of temper. He won an Olympic Gold Medal and a World Championship Bronze and Silver. His Silver medal was rescinded however as he was declared positive, following a drug test. 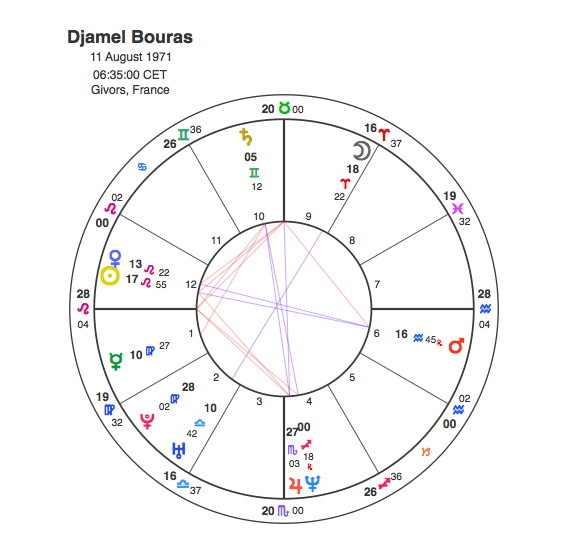 Djamel Bouras has a strong chart and a perfect one for an athlete. The Sun and Ascendant in Leo give great strength and stamina whilst the Moon in Aries indicates a competitive nature. The Sun is opposite Mars giving him a great deal of physical energy and this forms a T Square with his Midheaven as the apex, showing that these physical gifts would propel him a long way in his chosen career. The Sun opposite Mars could make him agitated but the sudden fits of temper would be particularly covered by the Uranus ( sudden outbursts ) in opposition ( tension ) to the Moon ( emotions ) in Aries ( assertive and combative ). The drugs ban is shown by an opposition between Neptune, the planet that rules drugs and intoxicants in general in opposition to Saturn in the 10th house showing the resulting fall from grace in his career. This opposition projects onto a T Square with the apex at Bouras’ Ascendant showing the negative impact on his image. Bouras’ time at the top was short and was defined by Pluto’s transit through this T Square between 1994 and 98. This transit began with the square to the Ascendant and conjunction with Jupiter in 1994 – 95. This was when he first burst onto the scene collecting a bronze medal in the 1995 World Championships. Olympic Gold was achieved in 1996. Whilst in training for the World Championships of 1997 he failed the test as Pluto was opposite his Saturn. Djamel Bouras had three crucial oppositions in his chart. The Sun / Mars created an powerful athlete, the Moon / Uranus gave him the nickname of the Squall and Saturn / Neptune showed his fall through drug taking.